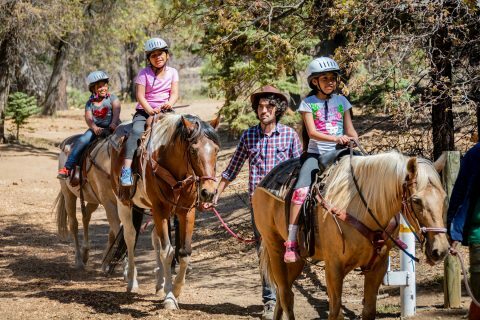 Children swirl among the towering pines of the San Bernardino Mountains with flashes of color and shrieks of joy. Wooden oars dip into chilly blue waters. Vivid drawings come to life on sheets of sketching paper under the tips of crayons and markers. Puffs of dust rise as horses meander along forest paths, gently carrying their cargo of gleeful kids. And in the midst of all the action stands the man who made it all possible — 91-year-old USC alumnus Otis Healy. He beams with pride as he takes in his legacy. 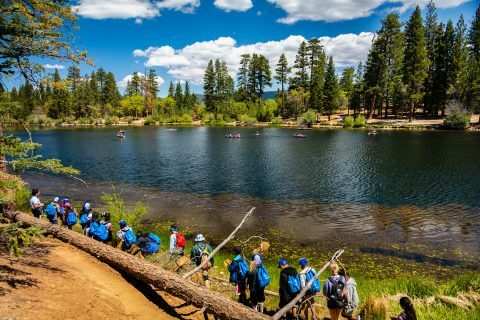 For 70 years, elementary school students from the neighborhood around USC’s University Park Campus have gone to a weeklong summer camp in the woods through Troy Camp. 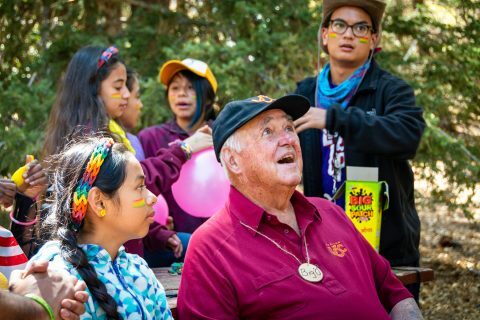 Credit for launching the popular program rests with Healy, who first proposed taking kids from South Los Angeles for a fun-filled trip out in nature when he was a junior at the USC Marshall School of Business, back in 1948. Today the institution offers more than summer camp. Now children involved with Troy Camp receive mentoring and support from USC counselors and volunteers throughout the year — from elementary school through high school. Funds are raised by students through an annual gala, grant applications to initiatives like USC’s Good Neighbors Campaign and donations from fans during football games. Other than a couple of faculty and alumni advisors, the program is still managed by USC students, matching Healy’s original vision. Along with marking the organization’s 70th anniversary, this year’s Troy Camp leaders had another reason to be nostalgic: Their campsite was within a mile of Jenks Lake, the location of Healy’s original gathering. 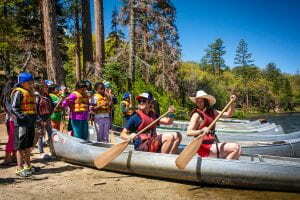 When he brought the first group of campers — about 60 boys — into the forest a few hours east of Los Angeles, Healy was joined by seven or eight other counselors. Now more than 80 counselors and volunteers, each of whom is known by a quirky nickname like “FireCat” or “Lunchbox,” lead the festivities. The camp is open to girls and boys, and 200 youth participate each year. They spend six nights in bunkhouses divided by age and gender. For many of the young campers, it is their first time away from their parents for more than a day or two, and their first time out in nature. They stare up at the night sky full of stars and marvel at the massive evergreens surrounding the campsite. At the recent camp, Healy and a few other invited visitors watched as dozens of kids donned life vests and clambered into metal canoes on Jenks Lake. Some stared warily over the sides, clutching their paddle to their chest until a camp counselor in the stern persuaded them to swipe cautiously at the water. Others showed no fear, taking deep strokes against the current. Along the shore, other children gathered for a hike around the lake or dunked brushes in lake water and began scrawling with watercolor paints on bright white paper. Later, after a special barbecue lunch, the children headed into the trees to practice yoga, twirl a lasso or play soccer. During a quick break in the shade, 9-year-olds Janet Guerra and Leah Popoca grinned as they detailed their adventures so far, such as making glowing slime as part of a “mad science” activity. Popoca described the thrill of canoeing on the lake and taking a dip in the heated pool, a luxury during chilly mornings before the fog burns off. Although she is still finishing up third grade at Magnolia Avenue Elementary School, Popoca is already dreaming about coming back to the camp as a counselor one day. In addition to more than 11,000 students who have come through Troy Camp since its founding, countless thousands more have benefited from free programs and support offered throughout the year in local schools around USC. In elementary school, students get help with homework during afterschool sessions and participate in extracurricular activities such as theatre, art, science, music and creative writing. By middle school, they are engaging in leadership activities and community service projects. Troy Camp volunteers also hold workshops for local high school students on topics like college applications, interviewing and public speaking skills, and appropriate use of social media. The programs are open to former campers and provided free of charge to about 700 kids each year. Camp counselor Ariana “Custard” Torres had never spent much time away from home when she was a young student at St. Agnes Parish School, so Troy Camp represented a lot of firsts: her first horseback ride, her first swim in a lake, even her first snowfall. Torres remained involved with the program, receiving advice from her mentor during the challenging transition from middle school to high school. She eventually became a junior counselor while in high school, one of 10 former campers selected each year to return as camp volunteers. Now she is entering her sophomore year at USC, where she studies anthropology and envisions a research career focused on primates. Julia “Rocky Road” Silva has a similar story. She first experienced Troy Camp as a fourth grader, then reunited with the organization as a high school sophomore at Ramón C. Cortines School of Visual and Performing Arts. Thrilled by the increased responsibility and leadership skills she developed as a junior counselor, Silva — now a global health major at USC — came back this year as a full counselor. Because they each have spent nearly a decade involved with Troy Camp, Torres and Silva bring a unique perspective to the students they mentor. Beyond a certain level of familiarity with traditions like camp cheers, they can relate to their campers based on shared experiences. On a typical day at camp, students are roused at 7 a.m. and pile into the dining hall for a themed meal. They might celebrate “crazy hair day” or “backward breakfast,” in which campers wear their clothes the wrong way. They split their morning between physical and creative tasks like crafts or archery, and participate in activities that build confidence and teamwork. 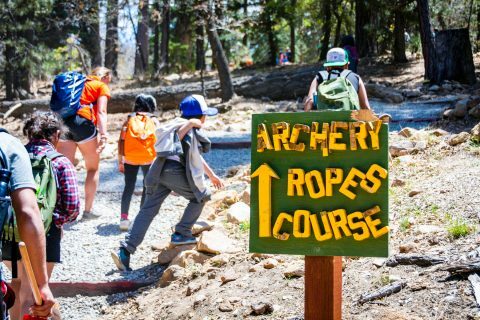 “It ends up being a great experience for the campers to be out of the city and meet friends from other schools and explore different worlds,” said Lilian “Whac-a-Mole” Aluri, co-executive director of Troy Camp and recent USC graduate. It also strengthens connections between the local community and USC students, she said, describing a special bond she developed with one camper her freshman year. Now two of the boy’s younger siblings have participated in Troy Camp, and Aluri has developed a close relationship with the entire family. With seven decades of success, there is little doubt the organization will remain a flagship student group on campus. It receives hundreds of applications for its 80-odd counselor positions each year and attracts top scholars — counselors have included Fulbright scholarship recipients, salutatorians and valedictorians. That gives Healy confidence Troy Camp will thrive well into the future. As he gets older, he’s not sure how much longer he will be up to making the 2½-hour drive into the mountains from his home in Newport Beach. But he can rest assured that his legacy will live on. His children also deeply support the camp. For now, Healy enjoys his yearly glimpse into the world he helped create. It also gives him a chance to relish the simple joys of camp, such as pulling back the bowstring at the archery range and helping plant a few evergreen saplings. To learn more about Troy Camp and how to support the student-run philanthropy, visit the organization’s website or contact USC Campus Activities, Attn: Troy Camp, 3607 Trousdale Parkway, Los Angeles, CA 90089-3103.